Enjoy a life where everything is within reach and you are at the center. Located along E. Rodriguez, Quezon City, a short ride away from Tomas Morato and Timog, with roads leading to Manila, San Juan and Makati, The Capital Towers offers a life where the avenues of your interests come together and options and opportunities are within reach. A private entrance, porte-cochere, and other convenient building features ensure that coming home always feels relaxing. Interconnected amenities and generously-cut condos for sale bring a sense of leisure and flow to your daily life, allowing you to enjoy a rhythm that is truly your own. The Capital Towers also has special units that are designed for people in need of a home office. 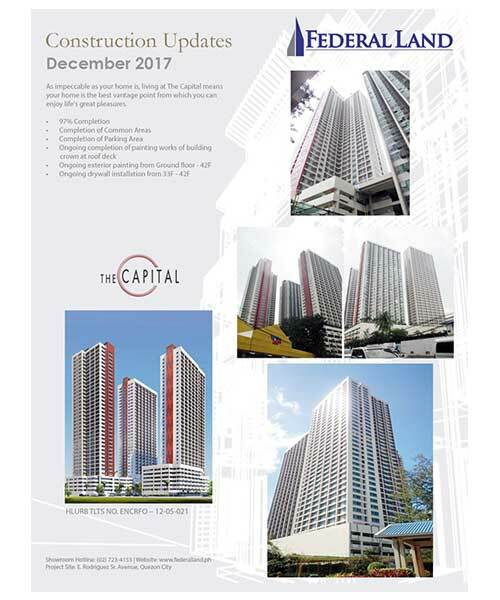 A life built around your wants and needs – this is the life we have designed for you at The Capital.